Common area five-year landscape refurbish plan has begun. The first phase of work this year has been rearranged to address the biggest problem by completely replacing the irrigation system with new upgraded pipes, valves and timer clocks. The current irrigation lines are breaking and failing on a daily basis not providing water to plants in some areas that are not surviving in the extreme temperatures, causing additional labor to fix the breaks and then having to do this again and again not being efficient with other landscape maintenance responsibilities. After meeting with several contractors, one was selected specializing in irrigation installation to conduct this work. Phase One of the landscape irrigation replacement project will begin near the clubhouse area and continue south to the Colonial/Westchester Drive cart path. Next summer in 2019, Phase 2, the remaining common areas with irrigation failures will be replaced. Once the irrigation system is in good order, Phases 3 through 5 will complete the project by updating the plants, rock and lighting. Construction of the clubhouse room expansion and balcony extension is underway. After years of planning with engineers, architects and inspectors, work has finally started. During the month of June, the initial stages of the work began – cutting concrete, pouring footers for columns, creating safety barriers and covering windows and installing posts to support the floor. The more technical and intense work begins towards the latter part of July and all of August. The massive steel beams will be set in place and welded; the new concrete flooring and balcony formed and poured. This work will be very interesting due to the limited access, size and weight of the construction material. The access point for construction workers to this area will be from the front clubhouse doors through the hallway and back out the doors towards the swimming pool area. This area will be restricted at times during construction. A section of the parking area at the clubhouse will also be restricted as a staging area for the construction material and equipment. City of Chandler officials and engineers have been very helpful and are inspecting the project step by step for structural stability and quality. This new additional room and expanded balcony will help the demand of more space for activities. It is anticipated that this will be completed in October. 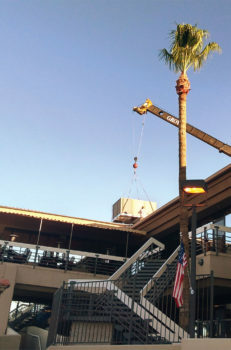 An air conditioner at the clubhouse quit working last month and was replaced from the roof last month by a huge crane. All (approximately 400) of the common areas trees and 120 palm trees were thinned and access trimmed. 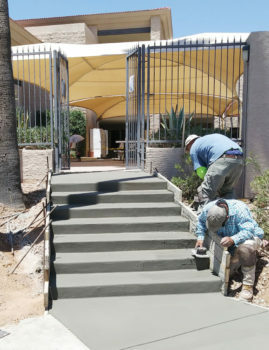 The old stairway leading from Waterview Drive to the clubhouse upper patio area has been demolished and replaced with new concrete and new handrails in the process of being installed for improved accessibility. A stall in each of the clubhouse main hallway women’s and men’s restroom has been modified for better disability access. The new billiard tables will be arriving and installed this month upgrading and replacing our current older tables. Ninety of the interior clubhouse fire sprinklers have been upgraded, as requested by the City of Chandler Fire Marshal. Clubhouse swimming pool deck was professionally cleaned and then cleaned again by the maintenance crew with great results. In a joint meeting with other communities in the area, SunBird Patrol Chief Tom Catri met with the Maricopa County Sherriff’s Sun Lakes Posse officials. 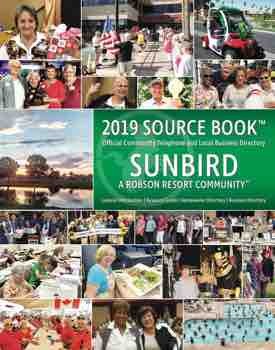 After discussion, it was learned that they would be willing to provide additional and more frequent services to SunBird without any expense to SunBird. We met with members of the Sherriff’s Posse in SunBird to discuss further details of this offer. They intended to patrol SunBird at much more frequently, almost daily and at night. In coordination with SunBird Patrol, they will also assist with crime prevention education, safety training and assist with enforcement. We look forward to this additional assistance to keep SunBird as safe as possible and deter potential crime. SunBird’s Veterans Memorial monument plaque is complete and looks fantastic. The plaque is a solid aluminum 3’ x 3’ with raised colored lettering to honor all veterans. This has been mounted on a column in the clubhouse main hallway across from the library for see and be proud of. All SunBird veterans of record have been sent a letter requesting to provide information and a picture to be placed in our SunBird Veterans Book of Honor. If this letter was not received by any a veteran or spouse of a veteran, please contact the SunBird office so that we can include all those who have served. We appreciate our many service women and men. In closing, we are sad to report Wanda Gastineau, Activities Director of 13 years at SunBird, passed away unexpectedly at her home this May. Wanda was nicknamed “Wonderful Wanda.” Her positive attitude, smile and dedication helped to keep SunBird a fun and active place to live. Our thoughts and prayers are with the Gastineau family, and we will never forget Wanda.